smoke.oil.salt, POT, Maude, and so many more. 2014 is already off to a raring start with the recent announcement of Petit Trois. Here are 18 other restaurants we’re looking forward to trying when they open later this year. ✦ Helm’s Bakery: The feeling was bittersweet when pastry chef Sherry Yard left Wolfgang Puck. Since last year, she’s been working with Sang Yoon (Father’s Office, Lukshon) on an ambitious new bakery at Helm’s. Needless to say, our mouths have been watering at the thought of this for the last 11 months. Targeted opening date: Mid-2014. ✦ Night + Market Song: Chef Kris Yenbamroong kept the location of his next project, a sort of sequel to his insanely popular Night+Market, on the down low for months. When he finally revealed the Silver Lake address, he told Eater L.A. about the concept: “If you picture halfway between an open air market and a Chinese takeout restaurant, it’s somewhere in there. For instance, beer signs, you see a lot of that in Thailand. I like beer signs. I like plastic plates from Action Sales. It’s going to be very functional.” Targeted opening date: February 2014. ✦ The Front Yard: Chef Warren Schwartz (Westside Tavern) seemingly could have picked almost any location to relaunch his culinary career. He picked an aging Holiday Inn in North Hollywood, where he’s currently cooking at the makeshift Warren’s Blackboard. It’s worth the drive, and the dismal decor. After renovations, it will be called The Front Yard. Targeted opening date: Mid-2014. ✦ POT: Hot off a national book tour, L.A.’s son Roy Choi is back to tackle his next new restaurant. Set to open inside the swanky new Line Hotel in Koreatown, the aptly named restaurant refers not to Choi’s penchant for marijuana, but for his desire to serve hot pot and “Korean food through the eyes of an American with Korean blood.” Targeted opening date: Early 2014. ✦ Adam Perry Lang’s Serious Barbecue: One of our favorite bites of the year, Adam Perry Lang’s meticulously smoked and seasoned ‘cue had us thinking of moving to Texas. Though a location has not yet been confirmed, rumor has it that Lang will move into a space in Marina del Rey this year. Targeted opening date: TBD. ✦ Roadhouse L.A.: Last year, The Improv on Melrose went under the knife. Part of the transformation is complete, but the part that will house Roadhouse, a modern barbecue restaurant and bar, is awaiting final approvals. Targeted opening date: If all goes well, January 2014. 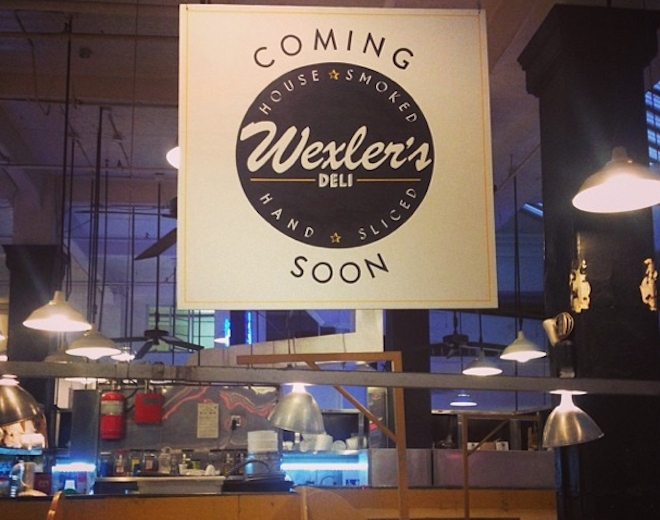 ✦ Wexler’s Deli: Micah Wexler has bounced around a bit since leaving La Cienega’s ill-fated but highly acclaimed Mezze. Late last year, he found a home inside the newly awakened Grand Central Market where he’ll be making artisanal deli meat. Artisanal deli meat! Targeted opening date: Early 2014. ✦ Mexicano: La Casita Mexicana’s Jaime Martin del Campo and Ramiro Arvizu are looking to serve enchiladas veracruzanas, carne en su jugo, and a dish called Taco Macho at their new Baldwin Hills restaurant. Targeted opening date: February 2014. ✦ Fifty Seven: Former Eleven Madison Park chef David Nayfield is the opening chef at the Arts District’s forthcoming transitional restaurant. Chefs will change seasonally. Targeted opening date: January 2014. ✦ Herringbone L.A.: San Diego’s Brian Malarkey is coming to L.A. to open an outpost of his popular Herringbone concept. Targeted opening date: Early-January 2014. ✦ Chorizo Amor: Chef Ricardo Diaz (Colonia Taco Lounge, Guisados) continues to expand his impressive and delicious empire of restaurants. Next up is this casual Mexican concept in Silver Lake. Targeted opening date: TBD. ✦ Old Lightning: We’ve been tracking this bar for nearly a year. Pablo Moix and Steve Livigni’s newest project promises to blow our socks off with drinks made from heirloom and actually antique spirits that they’ve been collecting for years. Located within Scopa Italian Roots on Washington in Marina del Rey. Targeted opening date: Early 2014. ✦ LA Chapter: The Ace Hotel is set to open its doors to visitors as of January 15. Could its signature restaurant, to be cheffed by Micah Fields, open soon after? Targeted opening date: January or February 2014. ✦ Superba Food & Bread: Partners in pizza and pasta crime Jason Neroni and Paul Hibler (Pitfire Pizza, Superba Snack Bar) have been teasing Angelenos with this project for over a year. But word on the street is that 2014 is the year Venice will get the team’s new bakery and marketplace. Targeted opening date: Mid-2014. ✦ Maude: Celebrity chef Curtis Stone (Top Chef Masters) is still working on his forthcoming Beverly Hills’ based restaurant. Word is that it won’t have a menu. Targeted opening date: Soon, early 2014. ✦ Redbird: Chef Neal Fraser (BLD) has teamed up with restaurateur Bill Chait to outfit part of downtown’s Vibiana cathedral-like space into a restaurant. This was supposed to be Grace, reborn. Targeted opening date: TBD. ✦ 7th Street Kitchen from Josh Loeb, Zoe Nathan, and Bryant Ng: Though the name has not yet been released, and construction has yet to begin, this new restaurant is coming at us from a dream team of culinary professionals. We can’t wait to taste what they come up with. Targeted opening date: TBD.